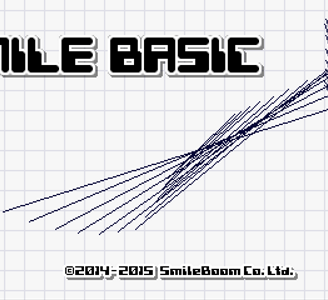 SmileBASIC is a software development application for the Nintendo 3DS, developed and published by SmileBoom Co.Ltd.. Like its predecessor Petit Computer, SmileBASIC is built around a custom dialect of BASIC called SmileBASIC. With SmileBASIC, users can write programs that use the 3DS's features and then upload the programs (or folders containing programs) to an online repository, where they can be downloaded by entering a short code. Downloaded programs can also be edited and re-uploaded. Programs can utilize the 3DS's touchscreen, controls, speakers, gyroscopes, and 3D screen. SmileBASIC works pretty well in Citra. Graphics look as they should on real hardware. The audio is prone to slowing down and stretching. SmileBASIC runs at a steady 60 FPS in the menus, console, and editor, but when you run programs it can drop to around 40 FPS, stretching the audio, but not affecting anything else. Playing MML will also kill the FPS. As Nintendo Network support isn’t available, you cannot download programs, but this can easily be fixed by putting programs in your sdmc\Nintendo 3DS\0...0\0...0\extdata\00000000\00001xxx\user folder.